The actress recently spoke with Ricky Camilleri of The Huffington Post about her job on The Big Bang Theory, motherhood and parenting, and her thoughts on breastfeeding. Bialik made headlines in 2011 when she posted a photo online of herself nursing her son, Fred, on a subway in New York City. Fred was 3 at the time. Bialik, who seems to do nothing in small doses, is an advocate of attachment parenting, a philosophy that promotes strong, secure attachments between parents and children. Parents are taught to become closely tuned in to a child’s needs and signals from infancy onward. She feels so strongly about this very close form of parenting she wrote a book — Beyond the Sling: A Real-Life Guide to Raising Confident, Loving Children the Attachment Parenting Way — published in 2012. Bialik, a vegan, is a self-described “die-hard Zionist” who frequently travels to Israel, where she’s spent several summers as a kibbutz volunteer in a dairy barn. In 2003, she married Michael Stone, a Mormon who converted to Judaism. Bialik and Stone, who divorced in 2012, have two sons: Miles Roosevelt Bialik Stone, born in 2005, and Frederick Heschel Bialik Stone, born in 2008. Between babies, Bialik earned a PhD in neuroscience from the University of California, Los Angeles (2007). She has bachelors’ degrees in neuroscience, Jewish studies, and Hebrew studies. 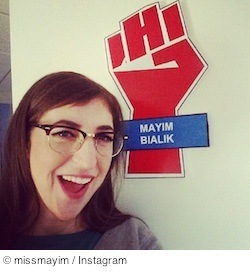 Source: “Mayim Bialik Proclaims Once and For All, ‘Breastfeeding is Not A Sexual Act.” HuffPost Parents. The HuffingtonPost.com, Inc. Feb 25, 2014. Web. Mar 2, 2014.